I love whoopie pies. They are the perfect combination of cookie and cake with a big ole' dollop of sweet filling in between. Every now and then I still see a post professing that they are the new cupcake, or macarons, which you know considering how long they have been around is kinda funny. In fact I know I did one myself a while back. It doesn't really matter to me if they're popular or not, just that they're yummy. I find them comforting. Pretty much they are one of the few things that I can not stop eating until I can't possibly fit in another one in. It is not unusual for me to eat 3 or 4 a day when I have baked a batch. No such luck, I didn't have any graham flour, not a bit to be found or the ingredients to make it up myself so I decided to modify their recipe to see how it worked out. It worked out pretty well, they were pretty yummy, I would recommend eating them within a couple of days for the best results as they became a little denser with age, unlike the chocolate chip whoopies I usually make. 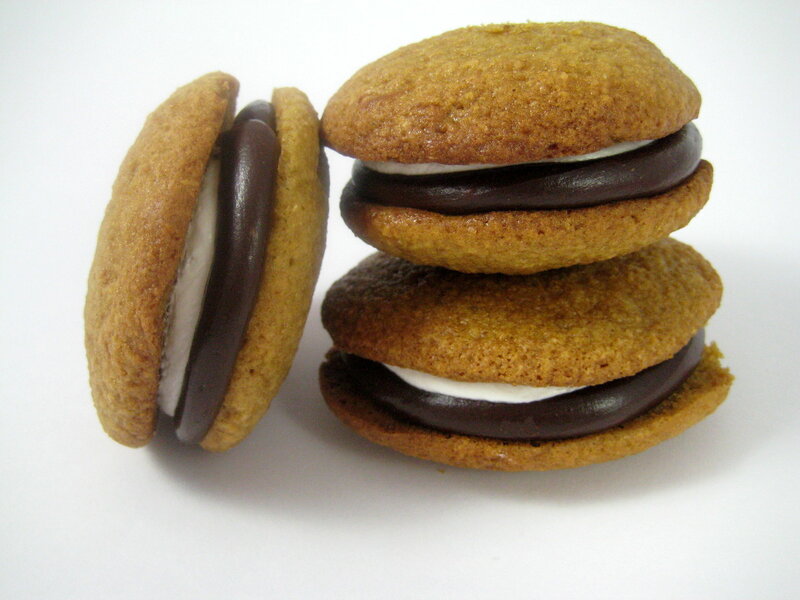 Oh and I feel like these whoopies are famous now. 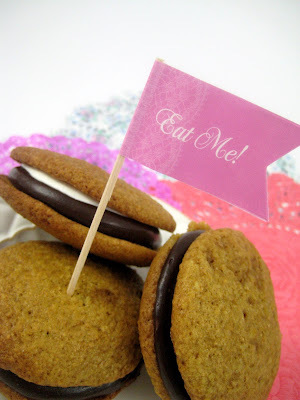 They were included in a cookie bar at a super amazing Western Party by Sharnel Dollar designs and featured on Amy Atlas. Preheat oven to 190C (375F ) and line a couple of baking trays with parchment paper. Sift flour, baking powder and salt into a bowl and whisk in the wheat germ. At high speed beat the sugar and brown sugar until light and creamy. Reduce speed to med low and add the eggs one at a time beating until combined and then the buttermilk and vanilla, mix well. Combine the milk, baking soda and vinegar in a bowl. Add half the flour mixture to the butter/egg mix and mix on low until combined. Mix in the milk mixture and then the remaining flour mix and continue to mix until well combined. Using a spoon drop Tablespoons of batter onto the lined baking trays leaving lots of room for the mixture to spread (around 7cm or 2 inches) and bake for 10 minutes or until the cakes begin to brown. Cool on trays for 5 minutes and gently remove to wire rack to cool. Sandwich these cakes together with marshmallow creme filling and chocolate ganache. I made a dam of chocolate ganache around the edge of the bottom pie and then filled it with marshmallow creme. When joined together the marshmallow oozed nicely over the top of the ganache. I would probably add another dollop of ganache into the middle of the pie in future for added chocolate yumminess. Chocolate ganache, in a microwave on med low setting melt together 225 grams chocolate with 1/2 cup cream for 90 second bursts, stirring between each interval until melted. Leave on a bench to cool and set until firm enough to pipe or spread. I am busting to try a whoopie pie - I'm reading about them everywhere but haven't tried one! My sister tried her first whoopie pie this week and is insisting I make some asap. Guess I have absolutely no excuse now! S'more please! These look wonderful. 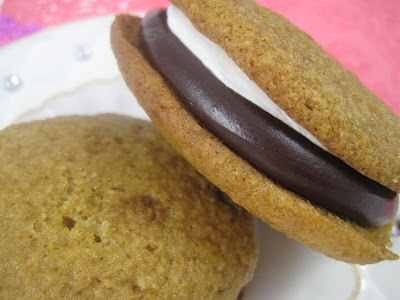 I haven't ried making whoopies yet :-) These have inspired me to get to it soon. these look and sound delicious, I love that you used wheat germ, making them healthy too. The wheatgerm makes them a health food right? They look perfect! Congrats on the big-time feature! my kids are saying WOW! 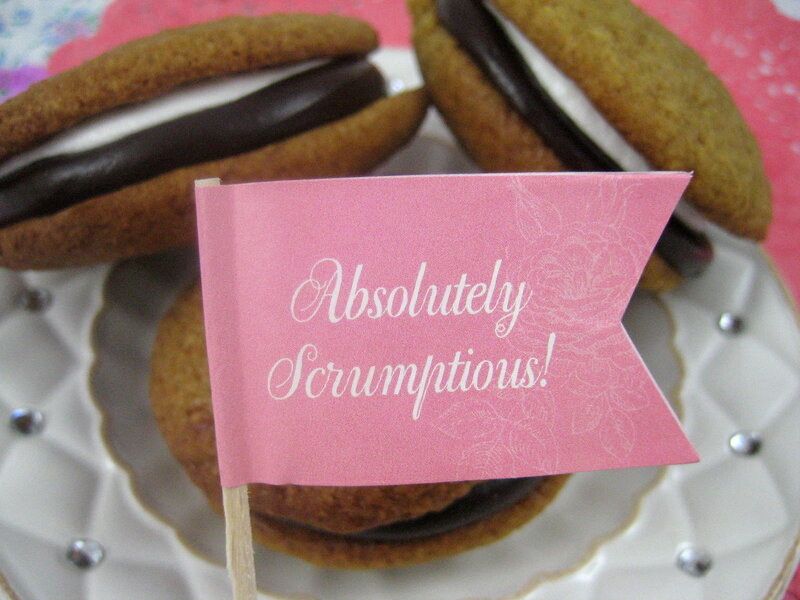 anyhoo, these look SO good, as do all your desserts actually and now I want some Double delights/whoopie pies, etc. Guess I'll have to maek some soon, Thanks for the reminder!! Your Whoopie pies look great. I also have that book a friend of mine bought for me, with a whoopie pie baking tray. I made Red Velvet pies. The kids love them. Double delights sounds like a good name. They look great!! that ganache looks heavenly.